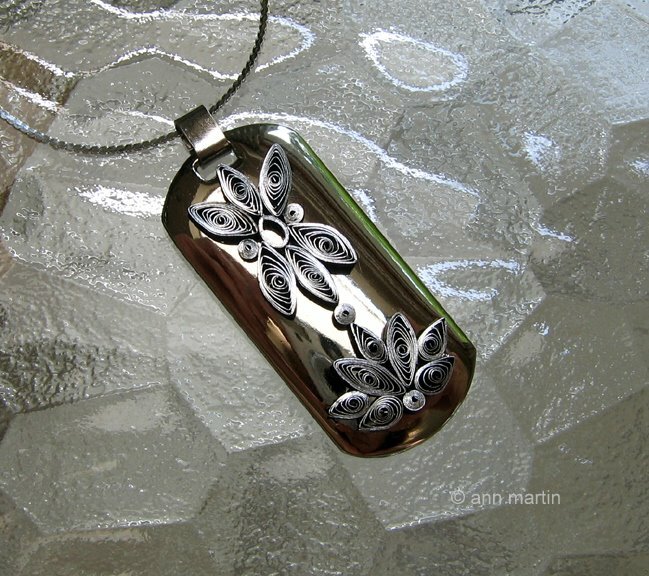 Last year I did an article about paper filigree for Belle Armoire Jewelry magazine. In addition to making several new pieces, I raided my jewelry box and drawers for things that could be repurposed. Perhaps you remember when every Nine West handbag came with a keychain. I'd taken this one off a new bag and put it away for a rainy day... but wait a second... wouldn't that nice, silvery finish make a great surface for some rolled coils? I'd just finished making a project with silver gilded paper and had some extra shapes that weren't needed. It was such a satisfying feeling to make a whole new design from leftover bits and pieces. 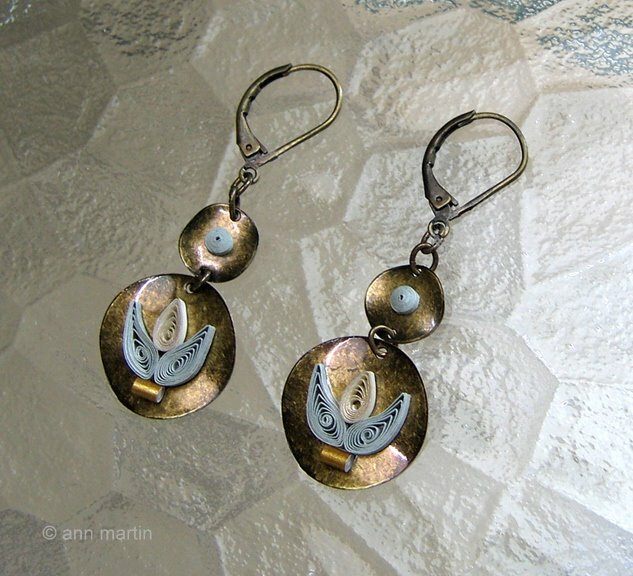 I've always liked this pair of hammered metal earrings, but thought they might look nice with an added bit of filigree. I used green, gold gilded ivory, and gold trim papers. 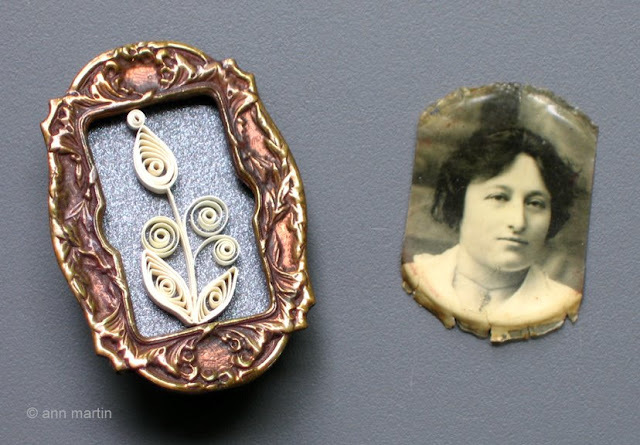 In the 1920s, apparently it was a popular style to wear a little shadowbox frame that contained a photograph. This one held a picture of my grandmother. I tried googling for more information about the fad... how it got started and how long it lasted, but came up empty-handed. If anyone knows, please send me a message. I was crazy about my grandmother and love having this picture of her as a young woman, but wearing it as a pin wasn't something I could see myself doing... in fact, I find it hard to imagine a woman back in the day with her own image on her lapel. And it would be a pretty strange gift to give to one's boyfriend since he certainly wouldn't wear it... so hmmm, the whole concept is a puzzle. Anyway... since the little frame is unique and quite pretty, I decided to add a tiny quilled flower; it's about an inch tall. Perhaps now the pin is more wearable, especially by someone who enjoys dressing in vintage style. I love how you see new possibilities in everything around you! I really liked your post. intersting!! Beautiful way to use up leftovers! It almost seems as though quilling has come full circle, from the days when nuns used the gold edges of their breviaries to quill altar crosses that looked like they were made of metal. They were popular during the Civil War. So, that gives you some possible starting dates (Victoria ascended to the throne in 1837, the same year as the invention of daguerreotype), as well as some information that the brooches were popular at the turn of the 20th century. And, if your brooch is from the 1920s, that gives another date. More than that I would have to do a couple more Google searches, and I need to make dinner instead. Thanks so much, everyone. Blaize, the links are wonderful - thank you for the information! 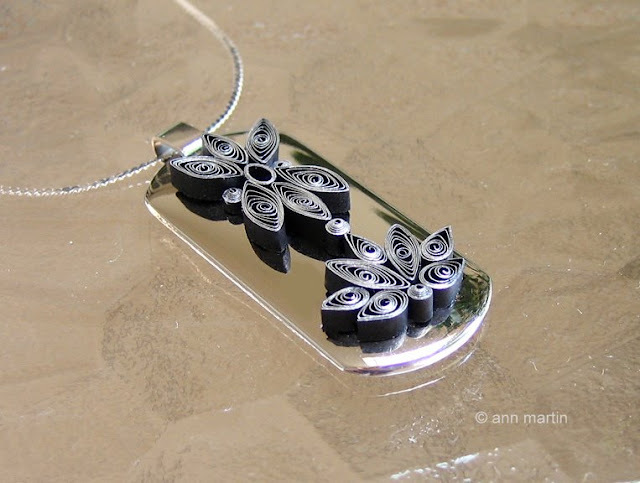 Ann, these are very special, and beautiful of course :) The story is a jewel on its own. Thanks! I love the paper you used, it makes a very elegant piece! You are a very crafty lady! I love these!